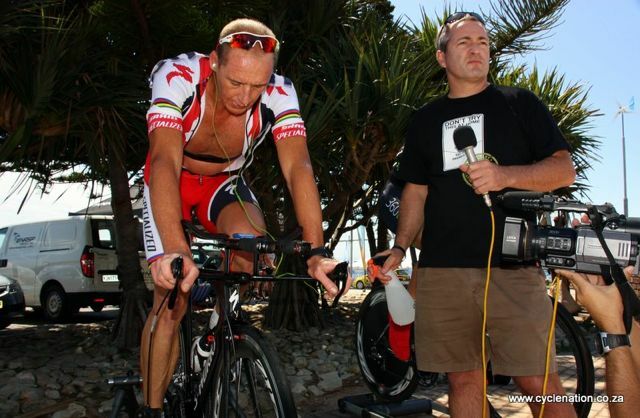 Warming up for SA TT Champs while coach Ian Rodger deftly wields the microphone and spray bottle. I will have to wait for the TV show to hear what he said- Jack Parow was pamping in the iPod. 2nd to 5th was only 20sec apart and I was only 2.5sec out of 2nd. I’m sure I could have puckered up and found a few seconds. Like I once heard a French coach yell at a youngster: “You do not think DURING the race, you think AFTER the race.” Old guys still learn lessons. 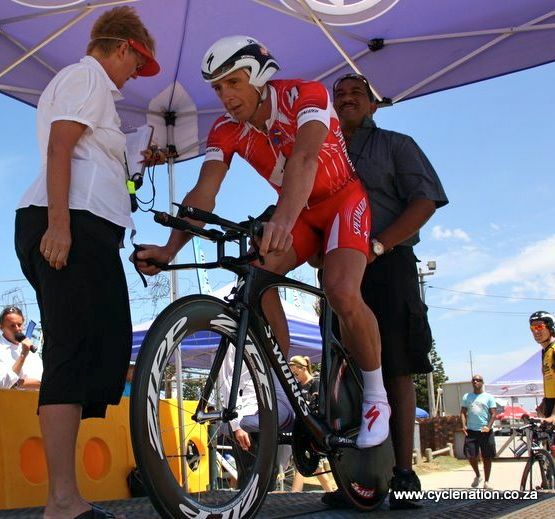 Results from Cycling SA website. Got this new toy from the good folks at Specialized. Quarq power meter which I run through a Garmin Edge 500 ANT+ unit. I’m new at using these tools. All I really need is Watts and interval time, but this thing is loaded with info- easy to get lost. Disappointed in the vagueness of the power curve on “Charts”. The “Splits” page has so much info- can one edit out items like speed, temp and calories to make space for the important stuff? 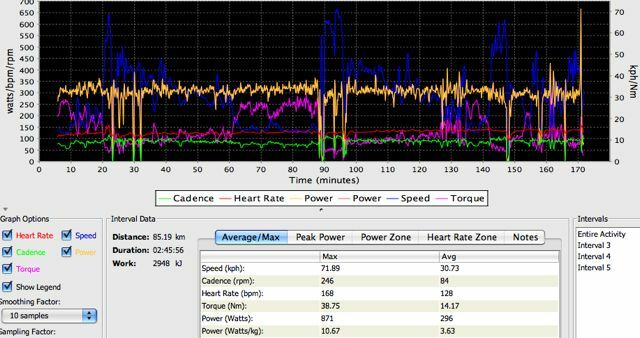 Was perplexed by the ghosting of the “Lap” button- it pressed itself a few times- hence the random intervals in warm up and cool down… I’m using the free Connect Garmin software. Suggestions welcome- Facebook is easiest way to communicate. Workout: 8x5min hills at 440-450 W.
Actually it was 10 reps, but it was 93Deg F (34C) and 1500m altitude (5000ft) – instead of the 1100m (3500ft) where I was supposed to do this session- always leave a rep or 2 in the tank- didnt want to blow a gasket. Filmed at the Specialized Team camp held in Stellenbosch in January 2010. 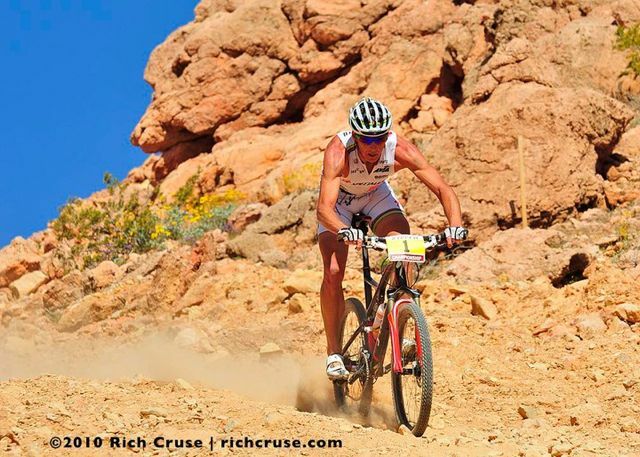 More pics from XTERRA Las Vegas coming in. Also, going down the pass I tried to shape myself into a parachute, because the 53×11 was not enough. Fortunately those 28mm Specialized Armadillo tires at 60psi helped slow things down and smooth the road a bit.